Back in Adro, Taniel Two-shot is still trying to figure out why he is still alive–he should have died when he tried to kill Kresimir, likely the closest thing there is to a god. Before he can, however, he must head to the front lines to help hold back the Kez army. He is one of the best soldiers left in Adro, and they need him. But without his father around to keep him outside of the chain of command, he’s bound to bump heads with some of the men and women in charge of the army. Inspector Adamat’s investigation for Tamas is over–he unravelled Kresimir’s promise, and found the traitor on the council. But his work is far from over. Lord Vetas still has his family held captive, and he’ll stop at nothing to get them back. This very well may mean that he’s going to break some rules–important ones–to try to get them back. He may end up in much more trouble than he ever bargained for. Nila has been captured by Lord Vetas, and now tries to keep her young charge safe in his household. But as she tries to escape, her story is about to get a lot more interesting. I enjoyed Promise of Blood, though I felt it had a few issues, mainly with characters acting stupid when I felt they should have seen something that was obvious to me as a reader. It was an engaging read, and I highly recommend it. The Crimson Campaign steps everything good up a notch, and takes the issues down a notch. It’s better in almost every way. The characters continue to grow, and the tension is constantly ramping up. There’s hardly a moment to breathe in the entire book. The hardcover comes in at just under 600 pages, but every one of those pages is powerful. I tore through it in two days, and I’m left wishing it had been about 500 pages longer, and that I had the sequel already. My soul for an ARC? My biggest complaint? The fact that the book seemed to end almost mid-scene for one character. There’s very little relief in the tension, and I have a feeling that, once the third book is released, the entire trilogy will read beautifully as a single story. If you’re the kind of person who wants a sense of finality in the books they read, a nice tying up of all major plot-lines, then you should wait until the trilogy is finished. McClellan avoids what is commonly seen as one of the biggest pitfalls in fantasy today. Many criticize some authors, such as GRRM, of growing their story too much, adding too many new viewpoint characters, and trying to juggle too many plotlines. While I enjoy the intricate stories that these authors create, and the massive scope they’re able to convey, I also love being able to read stories with a clean core cast, and McClellan manages to tell the tale in the second book without adding even a single viewpoint character to his cast. He’s even said that the third book is looking to be slightly shorter than the second. I’m glad that he’s managed to keep his cast manageable and his plotlines focused. His lack of female viewpoint characters is slightly annoying (Only 1 out of 4. ), but several female characters became stronger in this book–Vlora and Ka-Poel at the top of the list–and our sole female viewpoint, Nila, is poised to be, perhaps, the most interesting character in the third book. In addition, his short stories have focused mainly on female characters (Oh hi there, Verundish, it’s nice to see you again, even if you don’t get much page-time. ), and I felt this helped to flesh them out a little more in this volume, (and Promise of Blood), even if they aren’t viewpoints. It’s not terrible relevant to the content of the book itself, but McClellan’s covers continue to be amazing–and representative of the book itself. I love looking at his books on my bookshelf. Verdict: 5/5 Stars. Amazing book, powerful, never boring, beware of cliffhangers. You should get and read it as soon as you can. 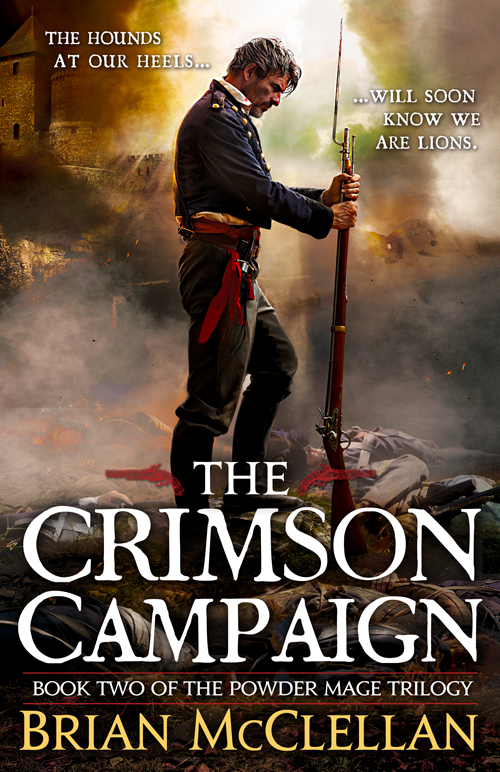 Since Amazon is misbehaving with regards to books right now, I’ll simply link you to Brian’s page for The Crimson Campaign, where you can find links to all the various places you can buy the book. You can even get a signed copy directly from him.